The Chaparral provides mobile short-range air defense to defeat low-altitude aircraft. The system is designed to be mobile, self-contained and air transportable. A mobile light air defense system with a turret mounted on a tracked vehicle carrying four ready-to-fire missiles, the Chaparral is a ground launched version of the air-to-air Sidewinder. Chaparral consists of an infrared heat seeking missile, a launcher with a Forward Looking Infrared (FLIR) sight, and a tracked vehicle. Chaparral was the Army's standard, short range, low altitude air defense system which provided point defense of vital corps areas against direct air attack. The missile is lightweight, supersonic, fire-and-forget, with an infrared homing guidance system capable of engaging fixed-wing and helicopter targets. To enhance missile acquisition range and capability the Rosette Scan Seeker (RSS) guidance section has been developed and is effective against infrared jammers. The missile is carried and handled as an assembled single round of ammunition. Used against helicopters and low flying fixed-wing jets, it homes in on the heat given off by the target aircraft's engine exhaust. Although US forces never fired this missile in combat, the system has been successfully used under such conditions by allies of the United States. The Chaparral Fire Unit may be used either carrier mounted or unmounted. The launcher contains a rotating mount that includes four missile launch rails and provides the gunner the means to aim and fire using automatic or manual tracking. Eight additional missiles are stowed in the vehicle. The system uses an M-730A2 cargo carrying, self-propelled tracked vehicle "9a" variant of the M-113 Armored Personnel Carrier, which can be made amphibious by adding an existing swim kit. A towed configuration is also available. The associated Forward Area Alerting Radar (FAAR) was a D-band pulse doppler radar used to detect low flying aircraft and provide alerting and tentative identification to CHAPARRAL and VULCAN fire units and Manportable Air Defense (MANPAD) teams. The radar had a range of about 20 kilometers, contained the Mark XII Identification, Friend or Foe (IFF) system, and transmitted digital data to the target alerting data display sets (TADDS) located with each CHAPARRAL/VULCAN battalion. The FAAR section consisted of three men and one vehicle and trailer. This system was made by Loral Aerospace Corporation at a cost of $80,000 per missile and $1.5 million per fire unit. 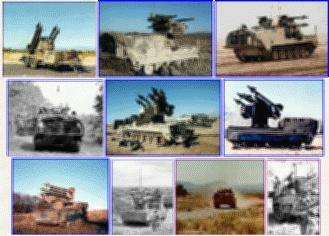 The Army had a total of 596 Fire Units with 5,358 missiles on hand in the early 1990s. Based on a December 1994 decision, Chaparral is being deactivated and removed from the US Army National Guard inventory. This action was completed by the end of FY 1997.